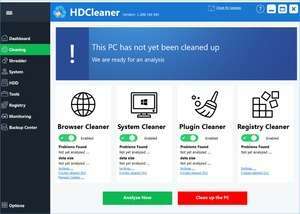 HDCleaner is a completely free all-in-one system cleaning and optimization tool which separates all of its functions into 4 tabs. Thanks to its display setup, HDCleaner's functions are all accessible within a click or two. Since it includes such a comprehensive list of features and functions, it's extremely powerful. Some of the easier tools to understand can be found from the Dashboard. Version 2018 (1.226) is a freeware program which does not have restrictions and it's free so it doesn't cost anything. For security reasons, you should also check out the HDCleaner download at LO4D.com which includes virus and malware tests. Additional screenshots of this application download may be available, too.